While the month of March is notorious for weather that "comes in like a lion," here at St. Francis Food Pantries and Shelters, we treat all of our clients like lambs, regardless of the elements outside. And it’s already been a busy winter, but we wouldn’t have it any other way! 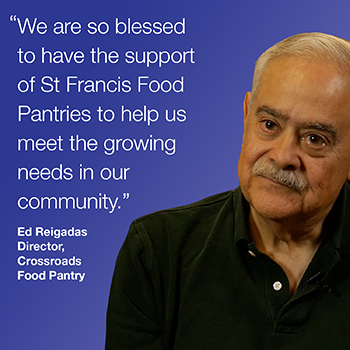 From time to time, we like to shine a spotlight on some of the pantries and shelters in the St. Francis network that are doing amazing work. The Crossroads Food Pantry has been open since the Great Depression in the 1930s. Working out of the basement of Holy Cross Church on 42nd Street, they have no paid staff – everyone is a volunteer. The director, Ed Reigadas, a retired business professional, has been a volunteer there for more than 20 years. The Crossroads Pantry covers the area in NYC known as Hell's Kitchen. They serve seniors, the working poor and children. On Saturday, February 9, 2019, St. Francis Food Pantries and Shelters held our Annual Dinner for the Needy at St. John's Church, near Penn Station in Manhattan. While some of our guests that day were homeless, some were simply folks in need of a helping hand (the working poor). Our numerous, wonderful volunteers waited on hundreds of our very special guests, serving them all a hearty, yummy "restaurant style" meal. People were able to get out of the increasingly dismal February weather and into a cozy, dry and warm place. They were able to relax, fill their bellies and experience a little community. 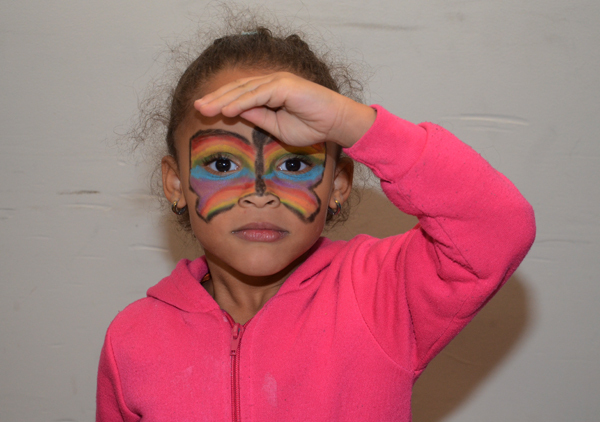 Our popular, annual Thanksgiving in February was held on Saturday, February 23, 2018 at St. John the Baptist church in Manhattan. Co-sponsored by our friends at Macy’s and ConEd, who collectively sent almost four dozen volunteers to St John’s church hall, this event couldn’t come at a better time, because mid-February is when we see a slowdown in both financial and in-kind donations, which is only natural as that’s when most people ease off the holiday season feeling of giving. Girl Scouts also have a rich history of giving back to their communities and are challenged to be part of that tradition by actively participating in service projects. The Cookie Share program, for instance, allows girls to collect donations of cookies for local charities. Throughout the Girl Scout cookie “season,” St. Francis purchases hundreds of boxes of cookies from the Girl Scouts, who in turn spend time helping distribute them at different food pantries, usually as special and welcome treats in our clients’ weekly grocery bag of staple foods!